The site design centers on the theme that Halleland Habicht is a part of their clients’ teams; Halleland Habicht staff go the extra mile, getting to know the client and their needs. 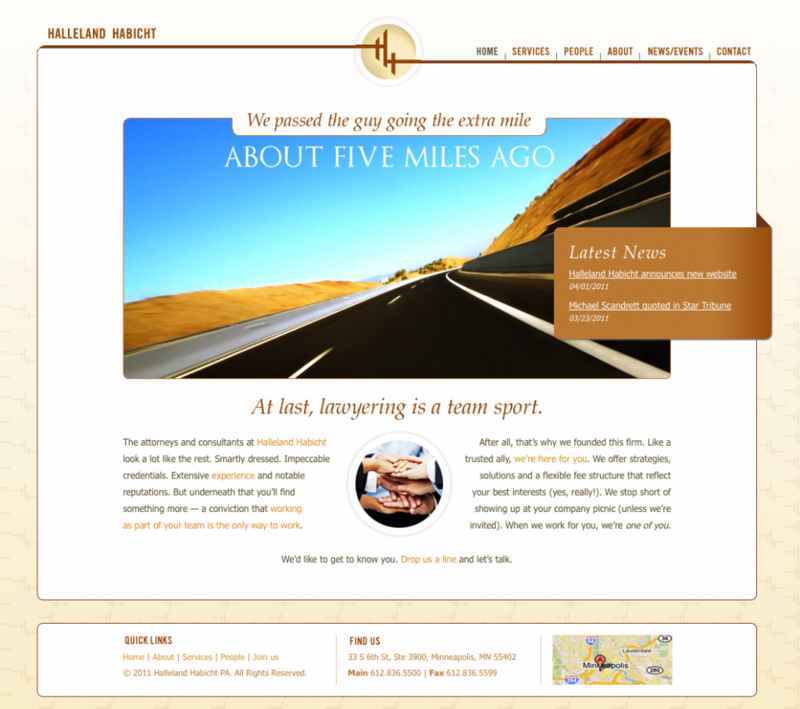 The design expresses the team approach and a sense of going the extra mile with warm colors and dynamic images. Headlines emphasize the firm’s dedication to their clients, while the rest of the copy reinforces the underlying conviction that the client comes first. The HH icon pulls together the site structure, embracing the content and providing a subtle message of the unexpected/change with the two levels of the Hs. Rounded corners throughout the design express informality, while circles echo the HH icon circle. A subtle HH pattern in the background gives the site depth, texture and movement, suggesting upward motion. The site also features original photography, shot on location at Halleland Habicht’s offices by Rod Wilson of Andrews Photography in collaboration with Mix Creative. The wide, panoramic nature of the site photos demanded a fresh take on the standard head shot. The resulting images convey the personality of the firm and the individual staff in a truly unique manner. The homepage features a news/events callout box that includes recent posts and links to the blog page. People pages feature a search function for finding staff by name or area of law. This entry was posted on Friday, April 1st, 2011 at 9:18 am and is filed under News from Mix. You can follow any responses to this entry through the RSS 2.0 feed. You can leave a response, or trackback from your own site. WONDERFUL website. Such fresh and symbolic design! I absolute love hearing what great things happen when WIN members come together. Thank you, Teresa! They’re really a great group of people, too! Great website! Clean, edgy design. Easy to maneuver about. Sorry – that should be YOUR client’s face.